This weekend saw the successful conclusion of another great dance season at Paula and Judy’s Dance Connection in Erie. 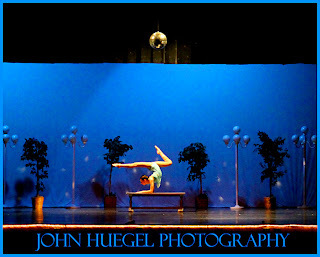 The 2009 Dance Showcase, held on June 12th and 13th, featured dozens of acts, from tiny dancers to adults, and from solo to large group productions. The variety of dance styles included ballet, tap, lyrical, acrobatic, hip hop, jazz and modern. This image, taken from the sound booth by yours truly, shows the great lighting and mood created in the theater auditorium setting. This move is called an “elbow stand” and requires strength, balance and grace. For a more technical description of how to capture good images in a dark setting, see my blog post under The New Professional Photographer blog. Paula and Judy and Jamie: Congratulations on another wonderful dance season and showcase! This entry was posted in Dance, indoor by admin. Bookmark the permalink.